Want to get your team to gel together better? Want to improve communication and teamwork? Get out on the water! Pilots train for several hundred hours in flight simulators in order to sharpen their skills before taking flight. Imagine how analogous simulations in your company would payoff in the real, bottom line situations your teams face every day. You could test philosophies, thoughts and actions, unlock hidden potentials, develop professional leaders—and build your team's overall effectiveness. Under the right conditions, team training on a modern sailing vessel can help your teams simulate these difficult and often stressful situations. Along with a professional facilitator, who provides feedback and teaching, your teams can quickly begin applying their new skills to company challenges. A yacht does not respect the hierarchical environments we encounter in traditional business, but it can bring out the best in everyone. Accordingly, Nautic7 offers the best experiential training exercises. 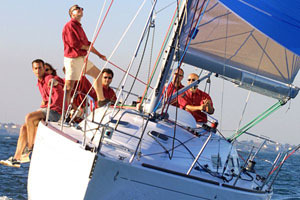 On a sailboat, team members are put through their paces in an unfamiliar environment, and they face unusual problems. It's a compact environment. There's no escape. Resources are limited. There's no individuality. The team must rely on each other. Physical strength or academic achievement is no advantage. Every team member is on an even keel. Communication, leadership and fellowship are paramount. Under such conditions, strengths and weaknesses quickly rise to the top. And your team grows stronger. For more information about how Nautic7 Organizational Strength Building through Experiential Training can help you spark creative energy, foster innovation and build camaraderie, contact Nautic7 today.